My fiancé has been working hard at his job in Tangier to save money and bank enough hours to be able to ask for time off occasionally to travel to Taza to see me. Our courtship has been very conservative and Islamic. What does that mean you might wonder? First it mean’s we are never alone. There is always another person nearby or in the same room with us. Since my family is in America – his father has been playing the role of my wali (guardian) and my fiancé thus asks him for permission to take me on walks, to go to the local garden or go to a café. He usually asks me what I would like to do and then asks unless he is surprising me. There isn’t much here in the way of public entertainment spaces – no movie theater, no ice skating rink or mall. It’s really limited to cafes, places to eat and gardens. Sometimes we just watch a movie together in the family’s TV room – on different ponj’s (couches) or we surf the Internet and watch funny videos together. All under the watchful eye of the family. This of course means mettling happens frequently. When Omar returns to Tangier I get asked every day – “Has he called you? Sent a message?” or something else along those lines. If he has been busy and forgotten – Omar can expect a call from his father telling him to call me. While I was home for vacation in December/January – Omar applied for a transfer to the Taza region. He got the transfer – which makes both I and his family happy to have him closer to home – his commute is only 30 minutes by grand taxi although his every other 24 hour shift work schedule is insane! When I returned from vacation the race to collect paperwork and get married got started. Thank god for the PCV’s I knew that recently got married! They were SO much help – SO shout out to Kelly and Christine – You both helped make this marriage possible along with your wonderful husbands! 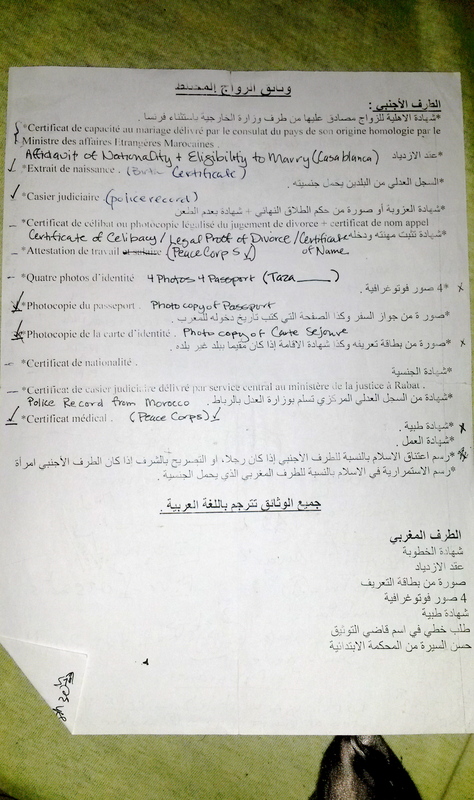 The paper chase started with going to the local court and asking them – what paperwork we would need and they gave us a sheet of paper that listed in Arabic and French documents that I would need to collect to get married which started in September 2012. Birth Certificate – An original or a official certified copy from the department of records in the city you were born in. If your divorced – you will need to provide original or certified copies of dissolution of the marriage. If you were widowed – you will have to provide the death certificate for your spouse or a certified copy of the certificate. ALL documents from the Consulate and abroad will need to be certified – each document is 40 dirhams to get certified at this office – also make sure to get there early 8:30 – 9am is best to make sure you are able to get in and get your documents certified. After all documents from the Consulate and abroad are certified now – you will have to translate them to Arabic. Each page will cost you 150 Dirhams = $18. The US Consulate says on the information sheet that they will give you that the fee for the adoul will be 150 dirhams – thats incorrect. Moroccans are charged between 600- 700 dirhams not including the tax on the contract. My husband and I were charged 1250 dirhams for a “mixed marriage contract,” even though I am a Muslim convert. We were also charged 700 dirhams tax on the contract. Once all your documents are certified and translated you can now begin the process of submitting them to the local court. You may also have to go to the local police for them to question you and provide documentation that you aren’t a criminal to the court. Which will then once done will get you sent to the adouls office to sign the marriage contract – at which point you are legally married. Congrats, Mahbrook and Hooary!! Get tested for AIDS/SIDA – which I would recommend both parties to do as AIDS is something that is very serious and you can’t tell by looking at someone if they have it or not. In most cases how smoothly the process goes is very dependent on the individuals you encounter and how well connected your fiancé family is or is not. Omar and I were running around like chickens with our heads cut off. I made two overnight round trip journeys with no sleep to Casablanca and Rabat at seperate times to get things taken care of. I am glad to say the translator was local and I didn’t have to leave my city to get that done. In the end Omar and I were married on March 8th, 2013 – International Women’s day and held our wedding on March 9th, 2013 at his families house with a few friends and family surrounding us. I had my family and some friends view the festivities via Google Hangout which worked like a champ for the whole eight hours. My family and friends back home felt very included in the whole event – which I am grateful technology was able to provide. So I am now officially Mrs. Omar Alexander – Sahmoudi although I am not legally changing my name for now 🙂 That would mean a hassle with my passport and other stuff I don’t even want to contemplate right now! Omar and I still haven’t gone on a honeymoon – although perhaps in the near future – we may save up and take a short trip to a European country that ISNT on the Euro. Congratulations!!!! So happy for you both! alif mabrook!!!!! How wonderful for you dear! That paperwork maze seems to be enough to test anyone’s resolve to be married! : ) May your marriage be filled with love and blessings! May Allah bless your union with peace, good health and children. You can read up in my blog about my first year of marriage in Egypt under “Making Hijrah”. Alhumdulilah for Islamic unions built on a foundation of halal. As for changing your last name, it’s not necessary Islamically. Infact, it’s even frowned upon. Originally, I thought it was a great show of solidarity but have come to think differently on it. It’s good to keep unity with our families of origin. wow congrats..thats very helpful~!!! about the criminal check.. did your embassy take care of that or did you have to contact your local police back home? The background check needs to be done by you -the embassy will not help with this. Did you get the documents translated in Cassablanca or Rabbat? Check the U.S. Consulate website for Morocco for a list of approved translators. They should have one in Rabat and Casablanca. Sorry I don’t remember. . I think neither. . I’m not sure if we got that far because the marriage was put on hold for a while and now we’ve cancelled everything . .wish you have better luck. . Ours was cancelled due to his father. But after a year his father said yes. But I lost a lot of money staying in Morocco for 6 weeks. So I didn’t want to go back. A question please ; about ”Affidavit of Nationality” the passport is not enough to proove the nationality? No the passport is not enough. The American in question will need to get this from the Consulate in Casablanca.